Add 400g Waitrose Linguine to a pan of boiling water. Cook for 5 minutes, then add 100g frozen Waitrose Petits Pois and cook for a further 2 minutes. Drain the pasta and peas. Whisk 300ml half-fat crème fraîche and 1-2 tbsp Yutaka Japanese Wasabi Paste together in the pasta pan and return it to the heat. 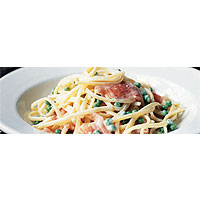 Add a 170g pack Waitrose Scottish Smoked Salmon Trimmings and the drained pasta and petits pois. Toss together until the salmon is opaque. Serve immediately with a crisp green salad and lemon wedges to squeeze over.